Today we are interviewing Bob Kern, author of We Were Soldiers Too: Serving as a Reagan soldier during the Cold War. Served in the infantry from 11/80 to 3/88. Retired hotel general manager. Raising three beautiful granddaughters with my wife of 23 years. The Cold War was an important part of history that ended with the fall of the Berlin Wall. Everyone knows the headlines of this era but few know the details and just how close the world was to World War III and a nuclear war. Politicians take credit for ending the Cold War, but the real credit goes to the men and women who served in the military. They trained hard and remained in a constant state of vigilance, ready to protect the world against a Soviet invasion and the spread of communism. I know veterans like it because I have had such an overwhelming, positive response from them, and not just those that have read the book. Hundreds of veterans have thanked me just for writing about our service. In fact, because of this, I am writing the sequel (which is quickly turning into two books) I think people who enjoy history will learn some things reading what was going on in the military in conjunction with world events of the 1980’s. What inspired you to write about your time serving in the military during the Cold War? The guilt I felt being thanked for my service after 9/11 because I knew people assumed I was involved in the war on terrorism and had no idea I was a peacetime soldier. I knew other vets had to struggle with this same guilt and shouldn’t. I wanted people to know Cold War veterans played a very key role in the world, particularly preventing World War III and a likely nuclear war. Your book explores valuable lessons about the Cold War that history hasn’t recorded. Why do you think history glazed over such an important part of world history? One of the things you do in the book is document your transition from a naïve 17-year-old to a trained soldier. Can you share a bit about what it was like during your first few days in basic training? Surreal. I grew up in a small town and was raised by a single mother and was completely clueless to what the real world was like. When the bus arrived at Fort Benning, I was certain the gates of hell had been opened and I had been thrown in. Are there any parts of your book that will surprise readers? The intensity and physical training we went through and the constantly being pushed to our limits. When my editor gave me the first round of edits, the first thing he commented on was the brutality of the training. He asked me if I could throw in some stories of what a normal day was like. I told him these were normal days in the infantry back then. There was nothing “9 to 5” about it. The history I intertwine into my story is very eye opening to most people. 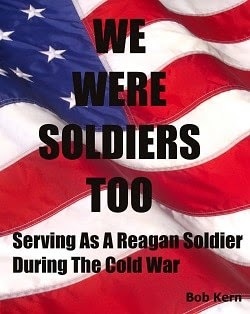 Everyone who didn’t serve has stated they never considered the guilt Cold War veterans feel. They then tell me how much they appreciate all veterans and their service no matter when it occurred. I knew this. The guilt is something that we feel and have to deal with and really has nothing to do with other’s perceptions of veterans. There thanks to veterans for their service are sincere. The response by readers so far has been overwhelmingly positive, especially among veterans. Why do you think your book resonates so strongly with people? Almost all Cold War veterans feel their service is unappreciated. Especially by the government. Many efforts to have a Cold War medal issued have been shot down by politicians because of funding excuses, which is very lame. Not to mention, most state benefits for disabled veterans require service during a time of war which is absurd. A disabled veteran is a disabled veteran that was hurt while serving their country. Do you see any similarities between US relations with Russia today and the relations during the Cold War? Russia has never completely shed communism with the government’s control of the main media outlets there. This made it easy for Putin to revert back to Soviet Cold War games. He maintains high popularity while breaking all sorts of international laws because he controls what the people hear and see. Very Stalinist. I have already started one, possibly two sequels, because of the wave of support from veterans. I was going to dedicate each chapter to a different veteran and their story to paint a larger picture than what my story was by including other jobs, years, and even different branches of the military. In laying it out, I got some great stories from veterans that served in Korea between Vietnam the first Gulf War. I am probably going to write a separate sequel for these stories. Both will be released this fall if all goes well. Honestly, I just want to do right by Cold War veterans. At the end of the day, these guys deserve to know their service was appreciated.